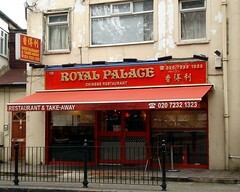 Royal Palace was a Chinese restaurant in Rotherhithe, a couple of doors down from Surrey Quays Station. It has now closed. As of July 2015 the premises are occupied by a different Chinese restaurant called Noodle Family (万家面馆). Chinese restaurant in Rotherhithe, a couple of doors down from Surrey Quays Station. Its Chinese name is 香得利, and it opened some time in 2003. Note that as of June 2010 they are cash-only — the nearest cashpoint is around 400 metres away at the junction of Lower Road and Rotherhithe New Road/Plough Street map. Royal Palace is one of those slightly frustrating Chinese restaurants that have two menus; one enormously long one with all the usual Anglicised staples, and another one written in Chinese that you'll only get offered if you ask for it (or perhaps if you look sufficiently Chinese). The Chinese menu includes what were described to us as Sichuan and Northern Chinese specialties. Happily, they do now also have an illustrated menu supplement in English that includes selected dishes from the Chinese menu. Inside, the decor is quite basic, with plastic tablecloths and a flatscreen telly in the corner, though they have put a few pictures on the walls to cheer the place up a bit. It's actually a reasonably-sized space, though, and could probably seat 35 or more. Kake and doop first visited on a Wednesday evening in April 2009. There were a fair few other people in, mostly on the younger side, and everyone except us was speaking Chinese. The flatscreen was showing some kind of talk show with the sound on (in Chinese). At the time, neither of us could read Chinese well enough to decipher a menu, but our waitress was kind enough to help us order from the Chinese menu. We suspect she may have gone for the "safer" options, but we still ended up with some reasonably tasty food. Our first dish was chicken cut into small pieces but still on the bone, cooked with dried red chillies, fresh herbs, and soy sauce. Despite being described to us as "spicy" it wasn't really; it was pretty flavourful for chicken, though. We also had a dish of braised greens with tiny enoki mushrooms; this again was perfectly pleasant. We accompanied this with boiled rice and a portion of boiled handmade dumplings, both of which were fine. Along with a bottle of wine between the two of us, our bill came to £20/head. As well as a la carte, they also do Chinese hotpot (steamboat); usefully, the menu for this is available in English. Although you can order your hotpot base stock and ingredients piece by piece, the best-value option for a group is the all-in deal. This costs £20 per person as of April 2010 (minimum 2 people) for a hotpot base of your choice plus 5 plates of ingredients per person. Kake, Ewan, Sarah, doop, and others tried this out in April 2010 as a group of eight, and found the selection to be ample, interesting, and good quality. We chose the yin-yang base, which is served in a divided pot with spicy stock on one side and non-spicy "medicinal" stock on the other photo. The 40 plates of food that were included in the £20 deal were more than enough to satisfy everyone photo of some of them, and with 50 ingredient options on the menu, it was easy to get a nice mix of meat, fish, seafood, vegetables, and carbs (we saved the latter to the end and could barely manage them). It's worth noting that we got a 10% discount for paying in cash (not sure if this only applies to large parties). Kake's verdict: I wish they'd translated all of the Chinese menu instead of just part of it, and the ambience and decor are very basic (perhaps more suited to a boisterous hotpot dinner than a quiet sit-down meal), but I do rather like this restaurant — it's probably my most-visited restaurant in the whole of London. I don't live as close to it as I used to, but I think it's worth a bit of a journey. Accessibility: A rudimentary ramp (really just a smoothed-over step) from the pavement to the area directly outside the door, and another shallow step to get in. It's all essentially on one level once you're in, though there is a slight change in level (not really enough to call it a step) on the way to the loos. Last visited by Kake et al., February 2013. Last edited 2015-07-05 10:32:08 (version 13; diff). List all versions. Page last edited 2015-07-05 10:32:08 (version 13).